New Lens Play with My Swimmer! 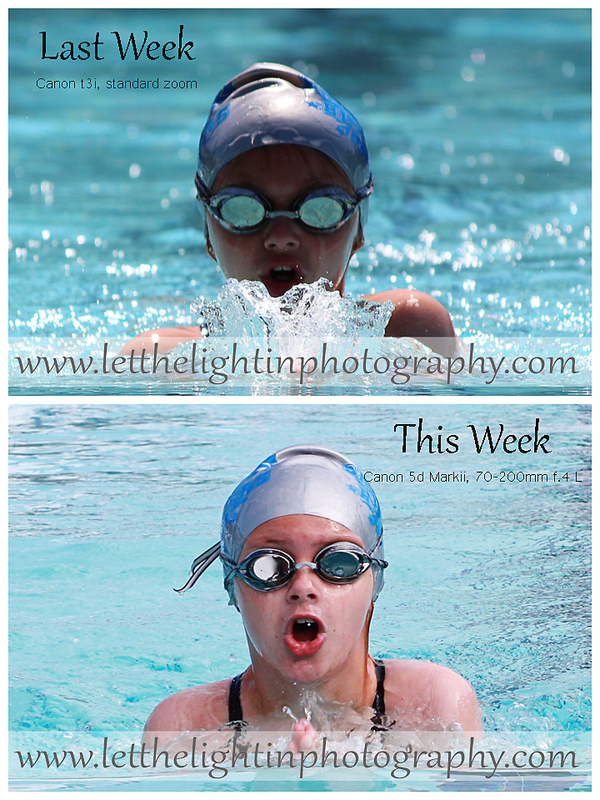 I had been really wanting a new lens for my recently purchased Canon 5D Markii to be able to capture my daughter’s love of swimming. Yes… I had my kit zoom that fit my Canon t3i but that lens is on compatible on my new 5D!!! Last week at swim trials I took photos with my t3i and kit zoom lens. Came home and downloaded them…ehhh, they were okay. I spent the rest of the afternoon searching for an off brand zoom for my 5D but decided that it was just too expensive. Fast forward to Tuesday night when I couldn’t sleep and then started searching for lenses again…dreaming of what I really wanted to get. The next morning got up and ordered the Canon 70-200mm f.4L online and thought I had lost my mind. I figured they have a 30 day return policy, that gives me three swim meets to see if it is worth it, right??? It arrived yesterday, pulled it out of the box and it felt like I held a MONSTER in my hands! I played with it for 10 minutes last night, that’s it. Took it to the meet this morning and took photos of my daughter and some friends kids, came home, downloaded them and WOW! Here is the before and after between the two cameras from one week to the next. They are slightly different shots but still the one from last week is what I felt was the best of the bunch. This weeks photo was one that was closest to last weeks shot and was half the distance of the pool further away from me than last week. In other words, she was swimming farther away and then I still zoomed in on her and then cropped the photo to bring her closer up. I realize that I still have a lot to learn about Sports Photography and plan to stick to getting great shots of my daughter and her friends for the time being but just wanted to share my new toy!